We’re excited to share with you that as of August 1, our company, which has been known as HRAnswerLink since its founding nearly 20 years ago, has rebranded. Moving forward, we will be Mammoth HR. You will continue to see the HRAnswerLink name, only going forward it will be the name of our HR technology platform, rather than the name of our company. If you have further questions, please review our Frequently Asked Questions or contact our Customer Care team. 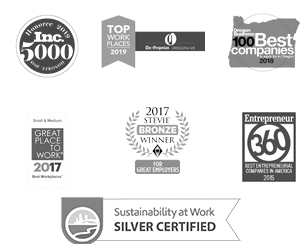 The Mammoth brand more effectively represents our commitment to being the long-term industry leader and providing you and your clients with dynamic HR expertise, content, and technology. But Mammoth isn't just a brand to us. It reflects our commitment to bringing big HR ideas and solutions to small and midsize businesses, and our highly collaborative approach to working with our partners and clients. The Mammoth brand also captures the 3 essential tenets — community, strength, and wisdom — that represent who we are as a company, how we approach our partnerships, and how we approach the practice of HR more generally. + What does the new Mammoth brand mean for current HRAnswerLink customers? During this rebranding process, there will be no changes to the services, technology, and solutions you and your clients rely on us for, or the ways we deliver them. We will continue to provide our white label services under your chosen brand, and you will continue to see the HRAnswerLink name – only going forward it will be the name of our HR technology platform, rather than the name of our company. + Do you still offer the same products and services? + Will the website my clients log in to change? No, the website your clients login to will remain the same. + Will Mammoth market to my clients? No. Our focus at Mammoth remains the same — supporting and promoting your relationship with your clients. Any client logged in our system under your account is restricted from our sales team’s outreach, and you can use the tools in our platform to control the communications your clients receive through our service. + Is the HRAnswerLink brand being retired? + Is there change in ownership? No. The company's ownership remains the same. We're rebranding so that our company name better represents who we are as a company and provides a better platform for growth and leadership in our field. + Is your mailing address changing? We've moved! Our new address is 100 SW Market St, Second Floor, Portland, OR 97201. + Have your telephone numbers changed? No. And if you need immediate assistance, please call (877) 882-2237. + Have your email addresses changed? Yes! You will be receiving emails from our new website domain, mammothhr.com. You’ll want to add it to your Safe Sender list/whitelist. The brand change to Mammoth has no impact on pricing. We strive to provide the best value in the industry, and we are always evaluating our pricing to make sure that we can sustain the quality of our products and services. + I just mailed a check to HRAnswerLink. Do I have to reissue the check? No, we can still accept checks addressed to HRAnswerLink for the time being. + Where can I go if I have additional questions or feedback? Connect with our team at (877) 882-2237, or email at: Customer Care team Monday - Friday, 5AM - 5PM PST.